Note that online bookstore descriptions may be incorrect and/or formatted unclearly. See below for correct description. 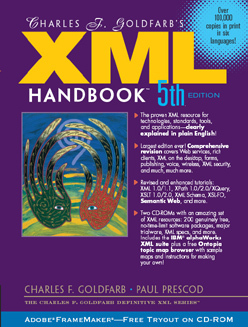 The XML Handbook is the definitive entry point to XML for Web professionals—content developers, managers, and programmers—but you needn't be a programmer to read it. Although XML, like HTML, is derived from SGML (which was invented by one of the authors), XML has so many more uses than HTML that an XML book must be much more than a markup tutorial or programming text. Part One is a 150-page non-technical introduction to XML that makes the body of the Handbook accessible. The introduction establishes hype-free, standards-based concepts and terminology that are used consistently throughout the book. Like the earlier editions, which were translated into five foreign languages, this edition is written to communicate to managers, content developers and technical readers alike. Just enough of the language is taught in this section for the reader to understand the next section. Parts Two through Seventeen contain detailed descriptions of the full range of XML applications: Web services, three-tier Web applications, data interchange, portals, content management, e-commerce, Web publishing, Enterprise Application Integration, Semantic Web, etc. ... including discussions of implementation tools and case studies. All of these are illustrated extensively with screen shots and examples. These parts include some 115 pages of introductory discussions and tutorials on subjects like EDI, schema development, RDF, and topic maps. Parts Eighteen through Twenty-three contain in-depth tutorials. There are 190 pages of tutorials on recently revised and newly finalized W3C specs like XSL, XSLT, XLink, XPath, schemas, and namespaces—plus 135 pages of tutorials on the XML language itself. The tutorials are fun and friendly, but also comprehensive, precise, and technically accurate. The book includes two CD-ROMs with 200 no-time-limit XML freeware programs, trial versions of major XML products, and the searchable full text of XML-related specifications. Industry experts from leading XML users and providers participated, including household names like Adobe, IBM, Intel and Microsoft. However, the final writing was done by the authors so that a consistent standards-based vocabulary and style are used throughout. CHARLES F. GOLDFARB is the father of XML technology. He is the inventor of SGML, the Standard Generalized Markup Language on which both XML and HTML are based. He is an independent consultant and speaker, and since 2006 has also been an advisor to ObjectBuilders. PAUL PRESCOD is a leading XML software developer, trainer, and consultant. He was a member of the W3C group that developed XML. The proven XML resource for technologies, standards, tools, and applications—clearly explained in plain English! Largest edition ever! Comprehensive revision covers Web services, rich clients, XML on the desktop, forms, publishing, voice, wireless, XML security, and much, much more. Revised and enhanced tutorials: XML 1.0/1.1, XPath 1.0/2.0/XQuery, XSLT 1.0/2.0, XML Schema, XSL-FO, Semantic Web, and more. Two CD-ROMs with an amazing set of XML resources: 200 genuinely free, no-time-limit software packages, major trialware, XML specs, and more. Includes the IBM® alphaWorks XML suite plus a free Ontopia topic map browser with sample maps and instructions for making your own! "This book is an excellent starting point where you can learn and experiment with XML. As the inventor of SGML, Dr. Charles F. Goldfarb is one of the most respected authorities on structured information." The proven resource for the world of XML and Web services—over 100,000 copies in six languages! Developers, architects, managers, and consultants rely on its technical accuracy, accessible writing style, and broad and deep coverage. Learn XML...154 pp. Use XML...564 pp. Master XML...406 pp. Start by learning what XML is, why it came to be, how it differs from HTML, and the handful of vital concepts that you mustunderstand to apply XML quickly and successfully—in your business and in your code. Learn when to use data or documents, how to decipher misleading industry jargon, and the key ideas of XML programming. Experience XML through illustrated explanations of technologies, tools, and applications: Web services (SOAP, REST, rich clients), security, integration, content management, databases, conversion, syndication, telephony, wireless, customization, portals, office suites, graphics, e-commerce (B2B, B2C, EDI, exchanges), publication (WYSIWYG, XSL, DSSSL), Semantic Web, and over 300 industry applications! Master the details from friendly, in-depth tutorials: XML (the full language: 1.0/1.1, namespaces, entities, DTDs), XML Schema (XSDL, datatypes), XPath 1.0/2.0/XQuery, XSLT 1.0/2.0, XSL-FO, InfoSet, VoiceXML, Web services (WSDL, UDDI), compression, XLink, XPointer (framework and schemes), and Semantic Web (topic maps, RDF). Plus: Over 250 acronyms defined! You can't tell a book by its cover—or even by its website—so we've included two chapters that you can read. Learn about "document-centric" and "data-centric" and why there isn't really a difference. It's all explained in Chapter 3, which you can download here for your personal use. Chapter 5, which you can download here for personal use, introduces XML applications that don't involve human interaction (those that do are introduced in Chapter 4). We don't report slips of the keyboard that aren't likely to confuse a reader (although we fix them in later printings). However, we do report known substantive errors. At the moment, there is one. Copyright ©2008 Charles F. Goldfarb. All rights reserved. Information on this site cannot be used or cited for any commercial purpose, although links to the site are welcome. Any questions, comments, or suggestions? Write to Charles at this domain.